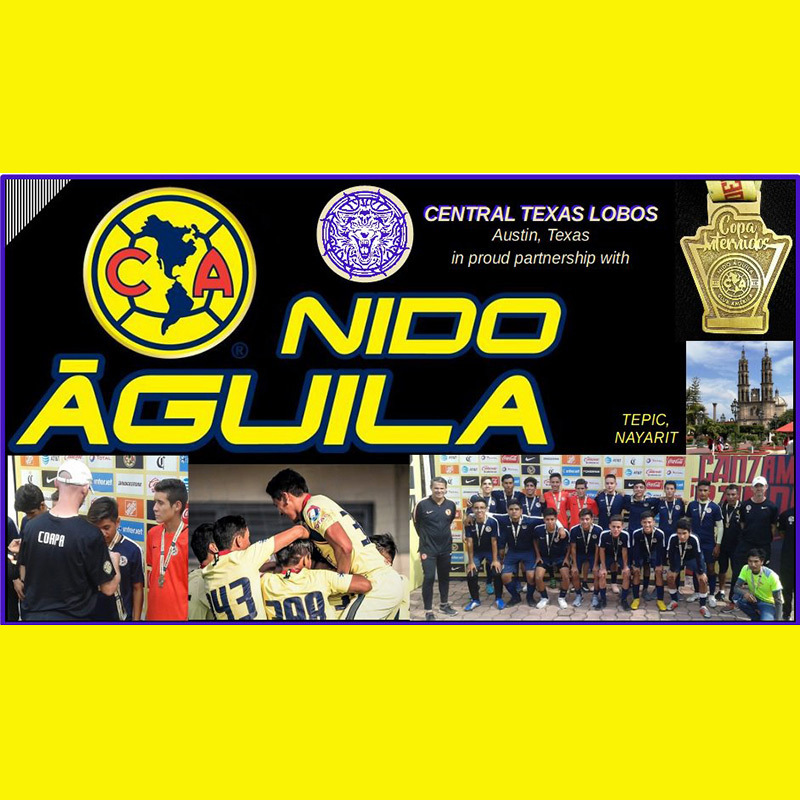 Central Texas Lobos announced their new partnership with Club America’s youth academy program and official football schools, “Nidos Aguila”, in Tepic Nayarit. In Nidos Aguila, Club America works with proprietary training methodology, with which they have forged great players and had great successes during its 98 years of existence. This program is an extension of the reserve forces of Club America and has the main objective of forming players with a Club America profile. Through the partnership, Central Texas Lobos will provide expanded opportunities for soccer players in the Central Texas region, as well as opportunities to players in Nayarit. Lobos President David Walding wanted the partnership to provide opportunities for its premier players, while also supporting youth development. The Nidos Aguila school in Tepic, Nayarit, begun in 2018, was a perfect fit since it focuses on a region of Mexico that has been traditionally underserved (similar to the Lobo’s “Academy Paraiso” program in Honduras). Walding noted that the partnership began “unofficially” prior to the Copa Internidos youth tournament in Mexico City on November 17-19, 2018. Copa Internidos brings U13-19 academy teams from the Nidos Aguila schools from across Mexico, the United States, Colombia, and Costa Rica, together for competition in Mexico City where players are scouted and trained by Club America staff. Lobos Youth Academy player and recent graduate of LBJ High School in Austin, Jose Mejia, Jr., began training with Nidos Aguila Nayarit in early November in preparation for the tournament. The director of Nido Aguila Nayarit, Salvador Rodriguez, subsequently extended an invitation to Walding to attend the Copa Internidos in Mexico City, meet with representatives of Club America, and discuss terms of the partnership. Walding assisted while Jose Mejia, Jr. participated with Nido Aguila Nayarit’s U19 team in the Copa Internidos 2018 (Jose has remained in Mexico for the near future to continue training with Nidos Aguila). While some specifics will still need to be finalized over the coming weeks, Walding and Rodriguez agreed on the final basic criteria of the partnership the day after Walding’s return to Austin, Texas. While full details are not yet disclosed, Walding stated that the agreement includes training, player exchanges, and tournament participation. For example, the Lobos will soon announce plans for a joint scouting combine in Mexico in late January, and both clubs are working on specifics for a summer youth program in Tepic Nayarit, available to the Lobos Youth Academy and, space permitting, other residents of Travis and Hays County. For more information on Central Texas Lobos and tryouts, please contact David Walding at 512-409-5263. 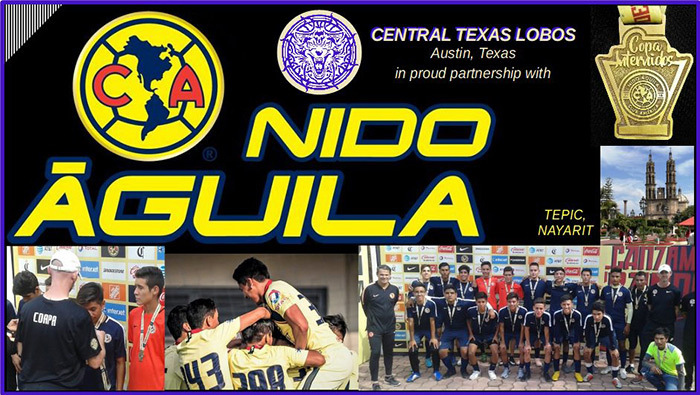 More information on the Nidos Aguila academy program is available at www.clubamerica.com.mx/escuelas/nidos-aguila.